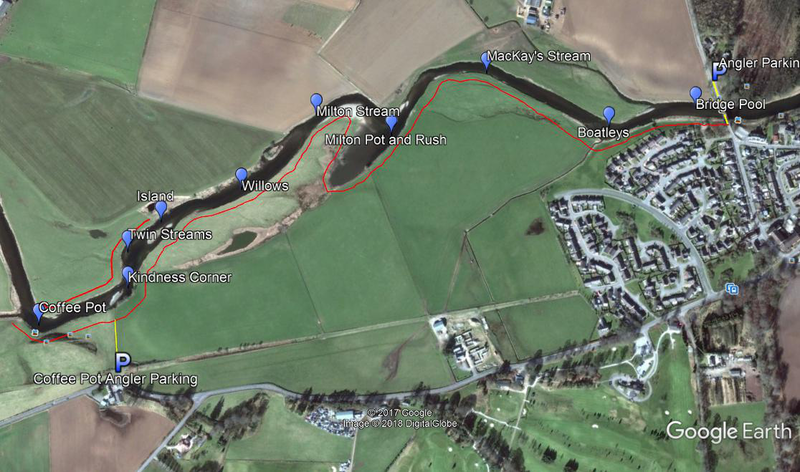 The Kemnay Angling Club beat is located in the middle section of the River Don 5 miles from Inverurie. It consists of 1,1/4 miles of South bank fishing and a short section of North bank fishing. There is tremendous variety of water in this beat, holding salmon, sea trout and wild brown trout. Wild brown trout are abundant in this part of the river with some large specimen trout of 5lb+ not uncommon. April and May are the best months to try for these brownies but they can be caught throughout the season with some skill. The water is easily fished and has great access throughout the beat. A maximum of two visitor permits for salmon and sea trout and two for wild Brown Trout are available per day Monday to Saturday, excluding October. Club membership is available to anglers resident in or within a 7mile radius of the village of Kemnay, along with a number of associate memberships for those living outwith this area. Adult, Senior, Disabled, Associate and Junior memberships are available. For season permits and membership details, please contact Gordon McDonald (Secretary) gmcd@btinternet.com or Jamie Urquhart (Chairman) jamieurquhart2@yahoo.co.uk or 07860846999. The Kemnay Angling Club beat is in the middle of the River nestled between the infamous beats of Monymusk and Fetternear Estates. It consists of 1,1/4 miles of South bank fishing and a short section of North bank fishing. The beat runs upstream from the road bridge in Kemnay village adjacent to Fetternear Estate, as far as the Ton Burn and its march with the Monymusk beat, a few miles from the village of Monymusk. The club has approximately 20 members and is fished relatively lightly compared to its neighbouring beats. There is tremendous variety of water in this beat, ranging from wide, fast flowing rapids to deep, slow pools and most variations in between. The beat holds a good number of salmon throughout the season due to the various pools, fast rushes and long deep glides present. It also does very well for sea trout from June onward. Wild brown trout are abundant in this part of the river with some large specimen trout of 5lb+ not uncommon. April and May are the best months to try for these brownies but they can be caught throughout the season with some skill. The water is easily fished by wading or fished from the bank in higher water conditions. The vegetation is kept well under control on the Kemnay beat which makes for easy casting and access throughout the beat. Parking is available at the top and bottom of the beats and good access is provided throughout with several recently refurbished styles crossing livestock fencing. Don District Fishery Board and River Don Brown Trout Improvement Association Conservation Codes must be adhered to at all times. Fly fishing only / barbless hooks preferred. Season: 1st April to 1st October. Bag limit of 2 trout per angler per day (not transferrable). Bag limit of 8 trout per angler per season. Return all fish under 12". Return all fish of 18" and over (2lbs +) (mature fish which directly contribute to the spawning stock). Use only knotless landing nets. Return all fish to the river carefully with wetted hands, held facing upstream until recovered.